in bottles and barrels of wine. The effect of tartar in improving the appearance of glass can be readily explained. 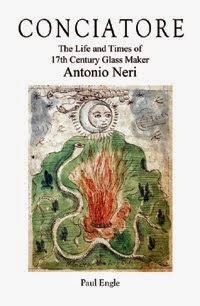 Most of the glass that was made in Italy in the seventeenth century used sodium-based additives to lower the melting temperature of finely ground quartz powder; these formulations are known as soda-based glasses. Potassium compounds can have the same effect and these 'potash' based glasses were predominantly produced in northern Europe where trees and plants rich in potassium were used. Potassium is a heavier element and it produces a denser, more refractive glass, giving it more sparkle, although not as much as lead imparts to crystal. Unfortunately, potassium also makes the glass harder to work for the artisan. 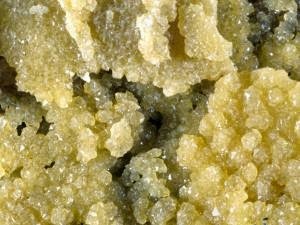 Potash glass stiffens more quickly as it cools, whereas soda glass remains workable for a longer time before requiring reheating in the furnace. Many of Neri's recipes blend the two additives, which we can imagine gives some of the advantages of both. The first step in making Neri's purified tartar salt is to obtain the raw "gruma, from barrels of red wine in which it forms large lumps." Next, he gently roasts it in terracotta pots "until it becomes calcined black and all its sliminess is roasted away. It then will begin to whiten, but do not let it become white, because if you do the salt will be no good." Now, he boils it in water for two hours, evaporating off three-quarters of the liquid. After filtering, he lets the remaining liquid "lye" cool in pans, allowing any sediment to settle to the bottom. He gently pours off (decants) the liquid which is further processed on the stove, this time in glass containers. The result, after full evaporation over a slow fire is a “white salt” left in the vessel. He dissolves this in hot water, filters it again and allows more sediment to settle out for a period of two days. Again, the liquid is decanted and evaporated in a glass container. The filtering and evaporation process is repeated four times, resulting in a product that is "whiter than snow." Ibid, ch 113. Note that in glassmaking, the term 'flux' has a different meaning than in metallurgy. Pure tartar takes the form potassium bitartrate KHC4H4O6. Ibid, ch 11. Polverino and rocchetta are thought to be forms of dried Salsola Kali plants. Tarso is Neri's term for white quartz river stones. Cristallino was a Venetian style glass that in quality fell between common glass and the premium cristallo, for which Murano became famous. * This post first appeared here on 5 Sept. 2014.